Video: Dr. Kevin Trenberth explains general climate sensitivity on Earth. Study: Climate sensitivity, sea level and atmospheric carbon dioxide. Hansen et al. 2013 (a) CO2 amount required to yield a global temperature, if fast-feedback climate sensitivity is 0.75°C per W m−2 and non-CO2 GHGs contribute 25% of the GHG forcing. (b) Same as in (a), but with temporal resolution 0.5 Myr and for three choices of fast-feedback sensitivity; the CO2 peak exceeds 5000 ppm in the case of 0.5°C sensitivity. The horizontal line is the Early–Mid-Holocene 260 ppm CO2 level. Climate sensitivity in its most basic form is deﬁned as the equilibrium change in global surface temperature that occurs in response to a climate forcing, or externally imposed perturbation of the planetary energy balance. Within this general deﬁnition, several speciﬁc forms of climate sensitivity exist that differ in terms of the types of climate feedbacks they include. Based on evidence from Earth’s history, we suggest here that the relevant form of climate sensitivity in the Anthropocene (e.g. from which to base future greenhouse gas (GHG) stabilization targets) is the Earth system sensitivity including fast feedbacks from changes in water vapour, natural aerosols, clouds and sea ice, slower surface albedo feedbacks from changes in continental ice sheets and vegetation, and climate–GHG feedbacks from changes in natural (land and ocean) carbon sinks. Traditionally, only fast feedbacks have been considered (with the other feedbacks either ignored or treated as forcing), which has led to estimates of the climate sensitivity for doubled CO2 concentrations of about 3◦ C.
The 2×CO2 Earth system sensitivity is higher than this, being ∼4–6◦ C if the ice sheet/vegetation albedo feedback is included in addition to the fast feedbacks, and higher still if climate–GHG feedbacks are also included. The inclusion of climate–GHG feedbacks due to changes in the natural carbon sinks has the advantage of more directly linking anthropogenic GHG emissions with the ensuing global temperature increase, thus providing a truer indication of the climate sensitivity to human perturbations. The Earth system climate sensitivity is difﬁcult to quantify due to the lack of palaeo-analogues for the present-day anthropogenic forcing, and the fact that ice sheet and climate–GHG feedbacks have yet to become globally signiﬁcant in the Anthropocene. Furthermore, current models are unable to adequately simulate the physics of ice sheet decay and certain aspects of the natural carbon and nitrogen cycles. Obtaining quantitative estimates of the Earth system sensitivity is therefore a high priority for future work. Gavin Schmidt noted: People often mean different things when they talk about sensitivity. 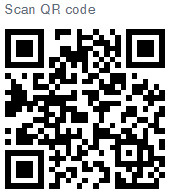 For instance, the sensitivity only including the fast feedbacks (e.g. ignoring land ice and vegetation), or the sensitivity of a particular class of climate model (e.g. 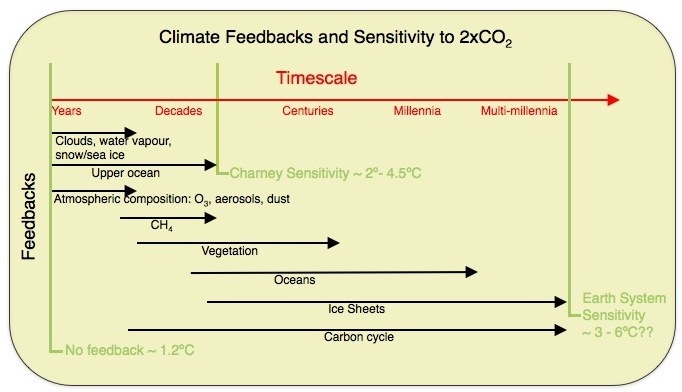 the ‘Charney sensitivity’), or the sensitivity of the whole system except the carbon cycle (the Earth System Sensitivity), or the transient sensitivity tied to a specific date or period of time (i.e. the Transient Climate Response (TCR) to 1% increasing CO2 after 70 years). As you might expect, these are all different and care needs to be taken to define terms before comparing things. I think he translated “hysteresis” into the notion of “memory.” Walk barefoot on a sandy ocean beach at noon and midnight in the summer and similarly in the water. The sand seems hot at noon and cold at night, and the water cool at noon and warmer at midnight. The water “remembering” how it warmed during the day is also seen over the year. See the difference between maritime and continental climates. Note the daily cycle between sea and land breezes. Differences in heat capacity is the basis. Isn’t the “water memory” he mentions, actually the heat capacity of water? I.E., the amount of heat (energy) it takes to change the temperature of a mass of water. I know he’s trying to make it a simple explanation (and does so quite well) but “water memory” sounds like homeopathy which we know for a fact, is bunk. The next el nino is going to be a doozy. Very straightforward explanations. Thanks so much for having the conversation, and for posting this. More please. What’s with all of the extreme weather?